For convenience, the Jeep Compass has ample cargo space. The power liftgate makes it easy to get your belongings in and out of the back. 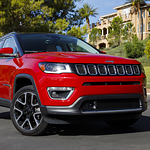 In the front, the signature grille announces the Jeep brand. The wheel arches on the hubcaps have been a Jeep signature since 1941. With body-color exterior mirrors that are accented with chrome, the Compass is impossible to miss when it goes down the street.